Home to eight of the world's highest peaks, Nepal is a mountaineer's dream. Most tourists begin journeys in the bustling capital of Kathmandu, soon making their way to the Himalayas. Whether exploring the Annapurna, Langrang, or Everest regions, trekkers will encounter turquoise lakes, mountain villages, and lush valleys with snowy titans towering above. Visitors will have no problem finding treks that suit their level of experience and budget. Hikers lighten their loads on 'teahouse treks' by relying on teahouses for food and accommodation, with both casual and veteran mountaineers equally captivated by the country's majesty. 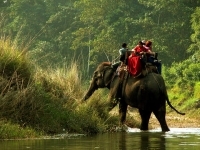 Travellers can further take advantage of the country's diverse natural beauty by embarking on white water rafting trips or exploring the jungles of the southern Tarai belt, seeking sightings of Bengal tigers from the back of an elephant. With countless shrines and temples scattered across the county, Nepal's spiritual and religious heritage attracts numerous pilgrims. 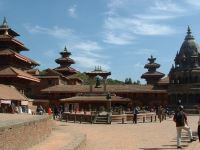 Travellers can visit Pashupatinath, one of the world's largest Hindu temples dedicated to Shiva, and step back in at the ancient royal cities of Patan and Bhaktapur. The UNESCO World Heritage site at Lumbini is seen as the birthplace of the Buddha while the 5th-century Swayambhu Stupa is one of the most sacred Buddhist sites in the country, with prayer flags fluttering from its golden spire.